We’d love your help. 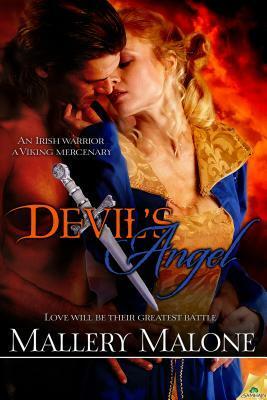 Let us know what’s wrong with this preview of Devil's Angel by Mallery Malone. Conor mac Ferghal wears his nickname, the Devil, like the visible scars on his face—and the invisible scars on his soul. The fearsome chieftain of Dunlough lives to protect his people, right down to the fishing village invaded by a marauding band of Viking mercenaries. When he realizes the pale-haired warrior who almost bests him is a woman, his first instinct is to fling her unconscious body into a mud dungeon. Erika Silverhair awakens, shocked to find herself and her men accused as the aggressors. She and her warriors have spent three years of Danish exile selling their skills for gold, defending the weak and the innocent. And no one, not even an intimidating giant like Conor, will take away the freedom that is her birthright. There is only one way to settle matters—finish the duel begun on the battlefield. Before the dark passion drawing them closer and closer threatens their closely guarded hearts. Published April 1st 2013 by Samhain Publishing, Ltd.
To ask other readers questions about Devil's Angel, please sign up.